HUA HIN, Thailand (AP) Garbine Muguruza rallied from a 4-0 deficit in the second set to beat Mona Barthel 6-3, 7-5 Wednesday in the second round of the Thailand Open. The two-time Grand Slam champion said it was a "difficult match." "She had a lot of advantages but I'm happy that I kept fighting and ended up winning," said Muguruza, who won the French Open in 2016 and Wimbledon a year later. Muguruza will next face eighth-seeded Dayana Yastremska, who beat wild-card entry Peng Shuai 6-1, 6-4. "In the first set, I felt really well on court but in the second set I felt a bit weak," said Yastremska, an 18-year-old Ukrainian. "But I tried to keep myself under control and stayed focused like I did in the first set, which is the key for me to take the second set." Yastremska beat Muguruza last year in Luxembourg, winning 6-2, 6-3. 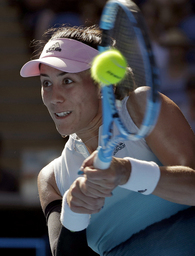 "She is young and has nothing to lose," Muguruza said. "She is playing well right now. It will be a tough match." Also, fourth-seeded Saisai Zheng beat Irina-Camelia Begu 6-2, 6-4 and sixth-seeded Ajla Tomljanovic defeated Kateryn Kozlova 7-6 (0), 6-1.